Comfort and cleanliness in the house is the cherished dream of all the housewives. But to achieve it, it takes a lot of effort. After all, in the struggle for purity, sometimes even such an assistant as water can be an enemy. Are you surprised? Passing through the layers of the earth, the water is saturated with various salts. The high concentration of calcium and magnesium salts makes water “hard”. When heated, “hard water” decomposes into carbon dioxide and a deposit, a so-called limescale that does not dissolve in water. This insoluble deposit settles on household appliances, plumbing, tiles, taps. Let’s figure out how to get rid of the limescale. Usually the walls of the bathroom are covered with tiles. Without proper care after a while tiles lose their original shine. Particularly contaminated are the joints, because of the limescale with time they turn yellow, and mold starts appearing there. To prevent this, it is necessary to systematically clean the tile from contamination. Do not use abrasive powders and pastes, which can scratch the tile. To clean it, you need to use creamy or liquid products. • then rinse the tiles with running water from the shower. All the work should be done in rubber gloves. If you are a supporter of environmental cleaning, thoroughly clean the tile joints and the tiles will the help of usual 6% vinegar. To apply vinegar on the wall, use a spray gun. Spray vinegar on the tiles and wait for ten to fifteen minutes to see the effect of acid, and then use a brush or a hard sponge to remove the scale. Finally, rinse the cleaned surface thoroughly with running water and wipe it dry. – it is easier to fight against limescale if the bathtub is made of cast iron or steel enameled, since powdery products can also be used. However, when choosing such an agent, read its composition, it should include anti-corrosion inhibitors. Agents containing sulfuric or nitric acid in their composition are better not to be used permanently, but only in case of very severe contamination as a one-time impact method. After using such chemicals, the bathtub must be thoroughly rinsed with water. • wipe the surface dry. • rinse the bath with clean running water. If you have a shower enclosure instead of a bathtub, then you will still have to deal with the scale. 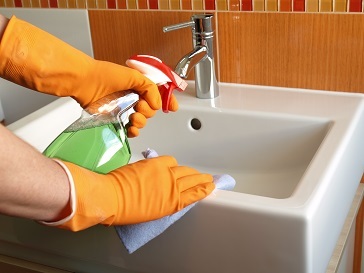 Wipe the limescale-contaminated area with a paste made of baking soda with a little bit of water. Leave the paste applied for a few minutes, then remove it with a dry cloth and rinse well with water. Mirror, glass shelves, as well as the glass walls or a glass door of the shower enclosure, can easily be washed (with removing the lime scale) with a soap solution. If the contamination is old, a solution of vinegar or citric acid will again help us out. • rinse cleaned areas with clean water.